If you've just picked up a 4K TV, or are thinking about making the jump, and want to pair the panel with a video game console that can do it justice, then this sweet Xbox One X bundle deal would be a great way to get gaming in Ultra HD. 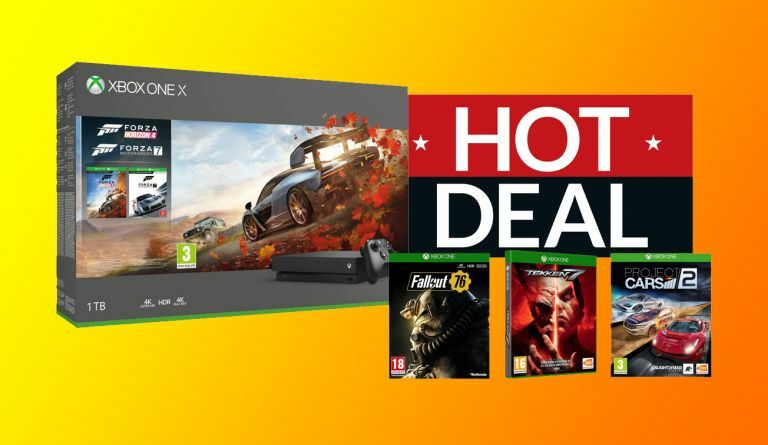 That's because you can pick up the 1TB version of the world's most powerful video game console along with Forza Horizon 4, Tekken 7, Forza Motorsport 7, Fallout 76, and Project Cars 2 with a very welcome £54.97 discount and free delivery right now over at Currys. As we note in our 5-star Xbox One X review, "there's no doubting the Xbox One X's power and, when it's fed games that have been programmed to tap into that, the audio-visual experience is best-in-class." And, simply put, this deal does that, providing you with great games that with 4K, HDR, and 60FPS well and truly enabled by the X's insane power, look absolutely fantastic. Want to pick up even more great titles to play on Xbox One? Then be sure to check out T3's authoritative best Xbox One games guide, which is loaded with fun and graphically spectacular games to play and collect.